Michael Carr, CPP, and Lisa Carr, CPP, are well known for event coverage for weddings and wedding portraiture such as engagement portraits and bridal portraiture. Many of the weddings we have photographed have been published in magazines such as Weddings in Houston, The Knot, Modern Luxury and InStyle Weddings. Having personally photographed over 500 weddings, our style of coverage has led us to many venues around Houston. Several clients have also contracted us to travel and join their families as their destination wedding photographer. Congratulations Lynette and Rowdy on your wedding celebration! To Lynette and family, thank you for having us back at the family’s ranch. The ranch served as the perfect location for Lynette’s bridal portrait session. To the team of professionals who helped create memorable images for the family, Thank You! To the family, thank you for your hospitality and accommodations. To learn more about our wedding and portrait photography, please visit our site or call 713-461-2862 to schedule an in studio personal consultation. 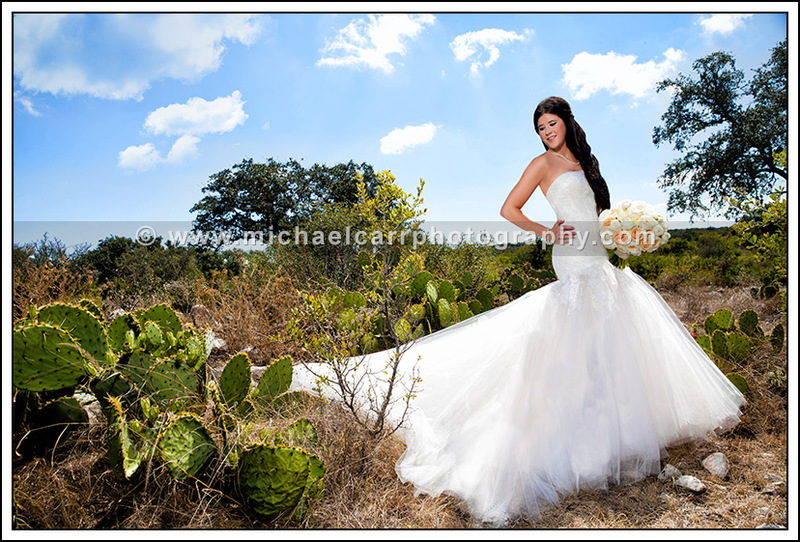 Houston wedding and portrait photographer, Michael Carr, photographed Chanda’s Bridal Portrait on location in Houston, Tx. The bride chose her wedding and reception venue, The Bell Tower, for her Bridal Portrait session. Michael photographed her with a mixture of indoor and outdoor locations. The bride had a clear vision of her portrait and so did her Mom. Her Mom wanted a classic full length portrait, and Chanda wanted something more contemporary and to showcase the architecture of the Bell Tower. Michael successfully captured a mixture of both classic timeless portraits as well as contemporary, and both ladies were very happy! To prepare for her bridal portrait session, Chanda called on a few top local vendors to help her out. Ann Whittington was her event planner, Façade applied her makeup, and her Bridal bouquet was created by Plants n Petals. 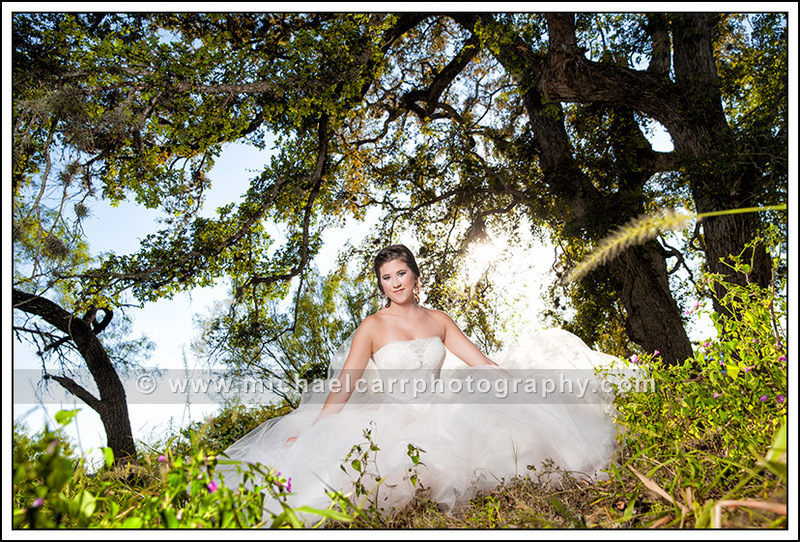 Houston bridal portrait photographer, Michael Carr, recently photographed Courtney’s bridal portrait on location. We met Courtney in 2008 when we photographed her sister’s wedding in Houston. When we were talking with Courtney about her vision for her bridal portrait, she knew she wanted a different location than her sister’s and she wanted it to compliment her gown. She also wanted flexibility with indoor options and outdoor options. We suggested a private location for her bridal portraits in Houston. She had many options for her final Bridal Portraits. One of these portraits is hanging in her parent’s home, and Courtney also has her own bridal portrait hanging in her home. Special thanks to the local vendors that helped with her portrait: Corinne with Façade Uptown did an outstanding job with her makeup and Plants n Petals designed her bridal bouquet. Michael Carr Photography is a full service portrait studio specializing in Bridal Portraits, Family Portraits, Children’s Portraits and Executive Portraits. You can view more of the studio’s portfolio by visiting here: www.michaelcarrphotography.com. 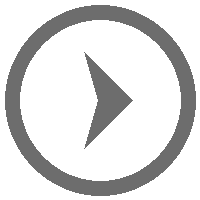 Our studio is conveniently located in the Galleria area in a commercial office building. Please call 713-461-2862 to personally speak with someone at our gallery, or schedule a time to visit. Houston engagement and bridal portrait photographer, Michael Carr, recently photographed Courtney & Brian’s Engagement Session in Richmond, TX. Since their wedding was going to be outdoors, the couple selected an outdoor location for their engagement portraits. We were able to photograph classic outdoor portraits as well as some casual, fun and relaxed portraits. Prior to their session, we spoke with Courtney over the phone and identified a few outfits for them to wear for their portraits. Courtney also had Corinne with Facade apply her makeup for the engagement portrait session. With the variety of images captured during their session, the couple was able to select a wall portrait and a portrait album to display all their favorite images. To view more of our portrait portfolio and services, visit our site here or call 713.461.2862 to schedule your session. Houston based wedding and portrait photographers, Michael and Lisa Carr, recently photographed Courtney & Bryan’s destination wedding in Vail, Colorado. The wedding and reception were both at The Ritz Carlton, Bachelor Gulch. We have known Courtney and her family for many years, since we photographed her sister’s wedding almost 8 years ago. 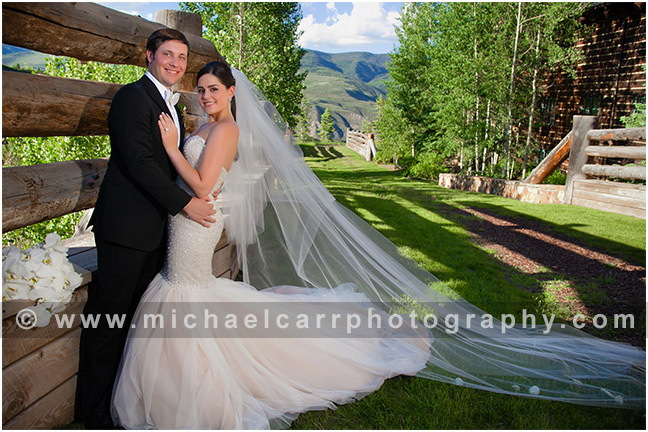 We were so honored they asked us to photograph Courtney’s wedding, at a secluded resort outside Beaver Creek! The weather was very nice on their wedding day. It was perfect for an outdoor ceremony in Colorado. Everyone enjoyed breathtaking mountain views and clear blue skies during the ceremony. After the ceremony, the guests enjoyed a cocktail reception on the balcony outside the ballroom. The candlelit reception was indoors, and after the seated dinner the guests danced the night away and enjoyed sweets at the custom desert station. Congratulations Courtney & Bryan, here is a sneak peek of images from your wedding.